The Turks after being defeated, by the Austrian-Polish troops in Vienna in 1683, were force to retreat. This defeat resulted various risings in the southern parts of the Balkan Peninsula. While the Austrians were spreading terror in the Turkish regions in Serbia and getting more deeply in the European part of Turkey, in Macedonia by the way, there were the aggressive troops of the local movement for liberation, that was becoming an local uprising. That uprising according the history, is known as the Karpos uprising. 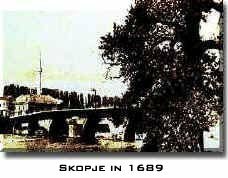 Picolomini captured in Skopje on October 25th, 1689. He didn't intend to go south, but the wanted to go on to Durres (Drach) through Albania. However first of all, he wished to destroy the Turkish fortification and thus to fill the Turks with terror. But unfortunately, there was an epidemy of illness, and the next day on October 26th, the general Picolomini commanded his soldiers to set fire in Skopje, and like Nero he watched the fire while listening to the music of his military band. He wrote all this to his king, Leopold 1st. After the fire, the Austrian army withdrew to Kačanik Pass and Kosovo. But the general Picolomini, had been infected by the plague in Skopje, and he died in the morning of November 9th. The general forces of the uprising that were settled in the liberated towns, Kriva Palanka and Kumanovo. After the massive attacks of the Turkish-Tatar troops, this cities fall again under Turkish rule. The Turks gathered their army and the staff held a counsel at Edirne, where the question of overcoming the uprising of the Macedonian miners under the leadership of Karpos was discussed. The task was carried out by Halil Pasha, who retook all the places that have been liberated by the miners. Skopje was the last to surrender. Karpos was captured in Kumanovo and brought to Skopje where he was hung on a tree near the Stone Bridge, butchered by soldiers and thrown into the muddy waters of the Vardar river. This was the bloody and the tragic end of the Karpos uprising, at the beginning of December 1689.